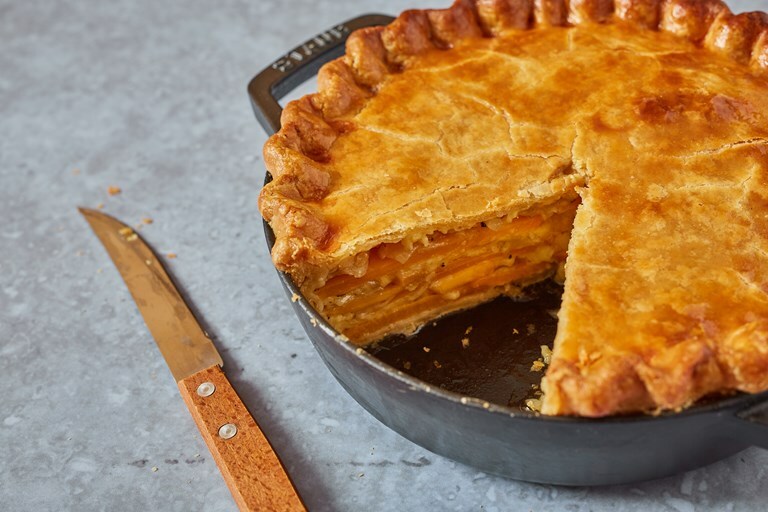 A swede pie recipe might not sound like the most exciting thing in the world, but Anna Tobias does the root vegetable justice by pairing it with softly cooked onions and bold Lancashire cheese. Take a look at Anna's other swede recipes here. I can say in all honesty that this is one of the most delicious things I’ve cooked in a long while. The flavour combinations are excellent – bitter swede, sweet onions and salty cheese. And most things are improved by being wrapped in pastry so it’s a winner. Alternative suggestion: the swede can be substituted with your root vegetable of choice, or indeed a mixture of roots. After Christmas this year I made a multi-root pie and threw in some leftover ham ends. It is an accommodating pie. Serves four hungry people, or six less hungry people.